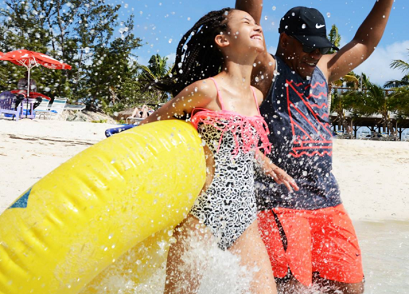 Your fun filled day includes Blue Lagoon Beach one of the most well-known, of Nassau’s natural attractions. At your leisure, you can enjoy Volleyball, Beach Soccer, Ping Pong Tables, Board Games, and the most beautiful crystal clear salt water lagoon you have ever seen! 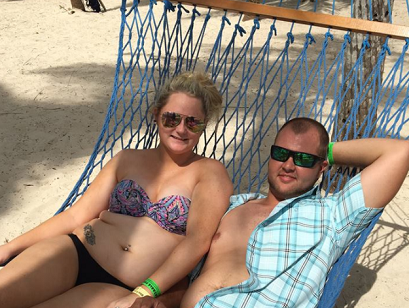 You can relax and enjoy the hammocks, beach chairs and picnic tables. Also included is lunch and a drink. 3 years old +. Scenic round-trip boat transfers to Blue Lagoon Island – view Nassau’s historic harbour, beautiful Paradise Island and surrounding islands. Also includes, Grilled Lunch & Drink, Use of the breathtaking lagoon beach area including hammocks, beach chairs and picnic tables, Use of volleyball, beach soccer, ping pong tables, and board games, Unlimited use of Big Boss Noodles, inner tubes and float mats. A Grilled Lunch – With Choice of a ¼lbs Angus Beef burger, 8 oz all beef Hot Dog, Grilled Chicken Breast, or Veggie Burger, BBQ Chicken, Peas and Rice, Grilled Corn, a Salad Bar with pasta salad, pickled beets, and more. Two homemade cookies and 1 cup of Fruit Punch, Iced Tea or Lemonade per person served with lunch. Extra Food and Drinks (alcoholic and non-alcoholic) can be purchased. The time slots available includes a guaranteed beach day and round trip ferry ride. This can be 4 hours of activities. 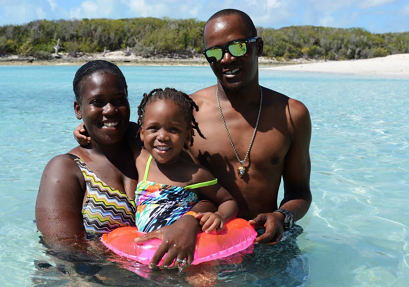 The Dolphin Facility is located on a private island called Salt Cay which is about 30 – 40 minute ferry ride from Paradise Island. You will get complete written directions with your ticket. Free Round Ferry Trip Transportation for all Participants from Paradise Island. You will need to get to the Paradise Island Ferry Terminal to catch the Blue Lagoon FREE ferry @ 11:45am Return 4:15pm. The Paradise Island Ferry Terminal is located between the two main bridges that connect Paradise Island and Nassau Bahamas. Your Cruise Ship must leave Nassau Port by 7:30pm or later to book this. If your Cruise Ship comes into port from 7:30am – 7:00pm, you will need to book your dolphin program with your cruise ship. You will need to take a taxi from the cruise ship terminal (Festival Place Welcome Center), located in downtown Nassau to the Paradise Island Ferry Terminal. Taxi cabs are readily available just outside the Welcome Center. This will take about 5 – 10 minutes to Paradise Island and will cost around $4 – $5 per person. Comfort Suites Paradise Island, Paradise Island Harbour Resort, & Ocean Reef. Visitors staying at hotels in downtown Nassau or the Cable Beach and are participating in the dolphin programs at Blue Lagoon by private taxi or can be picked up at your hotel by Johnson’s Bus Service for $12 per person round trip. Below are some hotels located in Downtown Nassau and Cable Beach, British Colonial Hilton, Sheraton Cable Beach, Nassau Palms Resort, Wyndham Resort & Crystal Palace Casino, & Breezes SuperClub. We can book Johnson’s Bus Service for you. When making your dolphin reservation, please tell us in your reservation form comment box and we will have your bus booked for you. You will pay Johnson’s bus service upon arrival. Worried that your lack of swimming skills will keep you from meeting a dolphin or sea lion? DON’T BE!!! 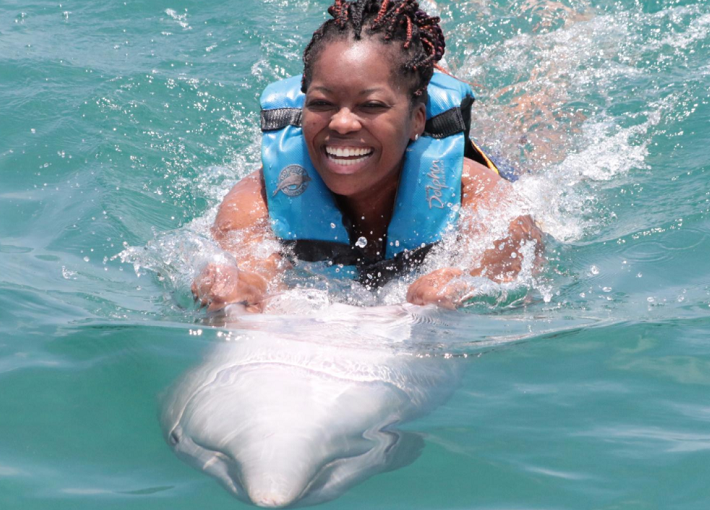 Our Dolphin and Sea Lion Encounter programs take place in shallow water where you will stand on a platform. The animals will swim up and over the platform where you can meet them one-on-one. We want you to feel comfortable and to enjoy the program as well. We welcome all timid and non-swimmers and encourage you to make your dolphin and sea lion dreams come true. How large are your boats? Our catamarans are large, double-decker vessels that can each carry well over 100 passengers. Each boat has a captain and mate, is equipped with life vests and is fully licensed and inspected. The ride is approximately 20-minutes and you never lose sight of land or venture far out to sea. Sit back, relax and enjoy as we cruise through Nassau’s historic harbour, past Paradise Island and over to Blue Lagoon Island. The boat ride is very picturesque and worth the trip! How do I get from the cruise ship to the island? You would be required to catch a taxi (automobile and not a water taxi) from the cruise ship pier to the Paradise Island Ferry Terminal for check-in. 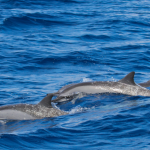 IMPORTANT: If you have purchased the Close Dolphin Encounter, Sea Lion Encounter or the Dolphin Swim directly with your cruise ship (either online or on board the ship), you are asked to meet our representative at the gangway at the time specified on the ticket that will be distributed to you on board the ship. This would allow for a direct transfer from the cruise ship pier to our facility. If you have booked your program directly with Dolphin World, you are required to check in at the Paradise Island Ferry Terminal at the time specified for your booking. We operate 365 days a year, rain or shine. Dolphin Encounters Ltd. will NOT refund for inclement weather unless we cancel the excursion. In such an event, we will contact you as soon as possible. If there is extreme weather in the area, we suggest that you call reservations (242-363-1003) regarding the status of your boat departure. Water temperatures range from 72° F (22° C) in the winter to 85° F (30° C) in the summer. What is the average temperature in Nassau? Is the Bahamas independent and what language is spoken? The Bahamas became independent in 1973 and is a member of the British Commonwealth. English is the official language. Is smoking permitted on Blue Lagoon Island? Smoking is permitted in designated areas only. This is for the safety and comfort of our guests, staff and animals. Where is Blue Lagoon Island located? Blue Lagoon Island is located 2 miles northeast of Paradise Island and Nassau. Blue Lagoon Island is approximately 2.2 miles long and features a gorgeous natural lagoon near the eastern end where our facility is located. The beach scenes in the movie “Splash” were filmed on Blue Lagoon. Are Blue Lagoon and Salt Cay the same island? Yes. Blue Lagoon Island’s official name is actually Salt Cay. Are there lockers, changing areas and showers on the island? Yes. We offer lockers free of charge to all of our guests that are participating in an animal interaction. There are lockers for rent at the beach. We also have indoor and outdoor showers. Are there food and beverages available on the island? Yes. We have a snack shop on the island which sells snacks, and drinks. On the beach lagoon side we have a full service grill and a bar. Yes, we have two well-stocked gift shops which sell Dolphin Encounters and Blue Lagoon Island logo apparel, T-shirts, books, jewelry, toys, towels, etc. Do you sell photos and videos? Our onsite state-of-the-art photo/video lab sells great personalized pictures of your interactions with the dolphins and sea lions. They come in a variety of styles ranging from key chains and refrigerator magnets, printed photos as well as digital images. We also sell DVDs of your Encounter or Swim program, which includes a pre-recorded section with highlights of Paradise Island, Nassau/Bay Street, and Blue Lagoon Island. Will there be other people in our program? 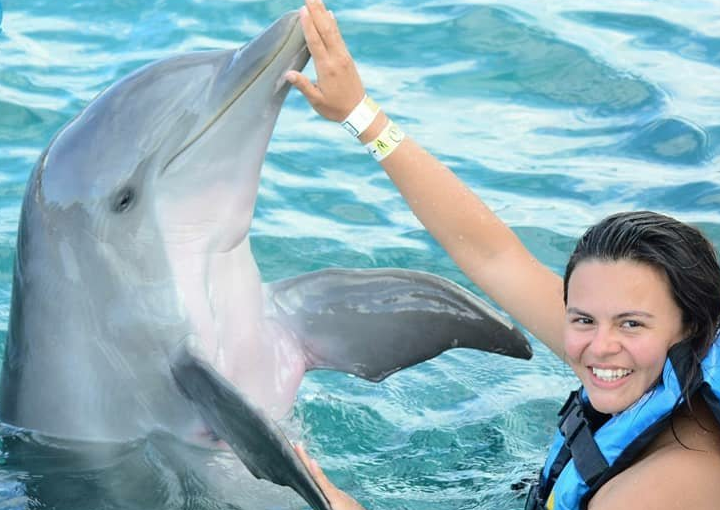 The maximum allowed in each “Dolphin Swim” and “Sea Lion Encounter” is ten persons and the maximum for the “Dolphin Encounter” is 30 persons although only ten people at a time are in the water interacting with the dolphins. How deep is the water in the “Dolphin Swim” program? Do you provide wet suits and life vests when it is cold? The water is 10-25 feet deep in the “Dolphin Swim” program. Wet suits (short type) are available at no cost, while life vests are mandatory in the swim program which help participants interact more freely with the dolphins by eliminating the need to tread water. Do you accept physically challenged or handicapped persons in your programs? Absolutely. 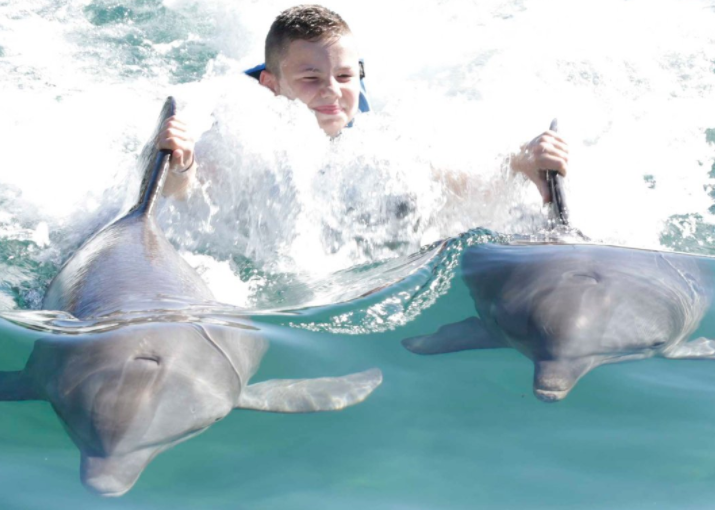 Dolphin Encounters caters to the physically challenged. When making a reservation, it is important to let our representative know the details of your disability. After our representative speaks with management, a decision will be made as to how to proceed. The dolphins are trained to interact with each person regardless of his or her size, shape, gender, or abilities. Foldable wheelchairs can used on our boats and the island is wheelchair accessible. Motorized wheelchairs are not suited for our boats and our staff are not able to lift them for safety reasons. Guests age 5 or younger are not allowed in this program. Guests ages 6 to 12 must be accompanied (in the water) by a participating paying adult (parent or guardian must be at least 18 years of age).Guests age 13 to 17 must be accompanied by an adult (Observer ticket is accepted) who needs to sign the liability waiver. Guests age 3 or younger receive free admission if accompanied in the program by a participating paying adult (parent or guardian at least 18 years of age).Guests ages 4 to 12 pay normal price and must be accompanied (in the water) by a participating paying adult. Guests 8 years of age or 48 inches tall may participate in the program. Guests 8 – 12 must be accompanied by a responsible, paying adult (parent or guardian of at least 18 years of age), with a ticket for the Sea Lion Encounter. Guests age 13 to 17 must be accompanied by an adult (with any paid ticket) to sign the liability waiver. 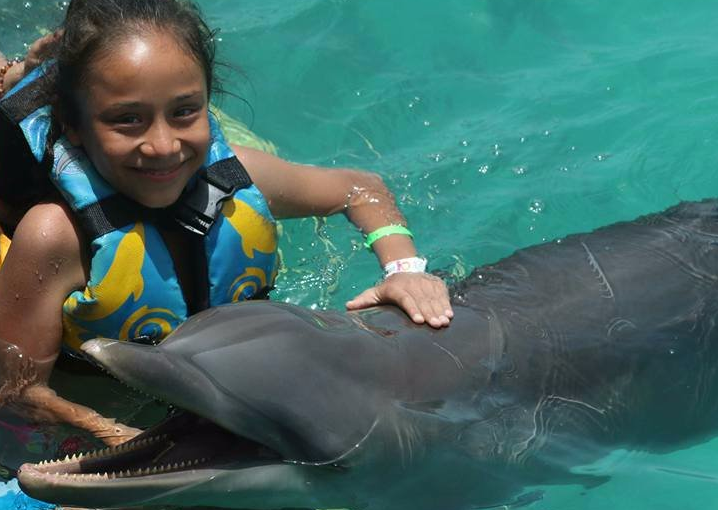 You do not need to be a swimmer to participate and enjoy the Dolphin or Sea Lion Encounter program – we make sure that you may also realize your dream of meeting and interacting safely with our dolphins. You will be wearing a life-vest in the Swim Program. However, we strongly recommend that you have at least basic swimming skills for the Swim Program. How many people are allowed on the platform? A maximum of 30 people are allowed on the Dolphin Encounter platform but only ten people at a time will be in the water interacting with the dolphins during the program, and a maximum of 10 people are allowed on the Dolphin Swim or Sea Lion Encounter platform and in the water with the animals. 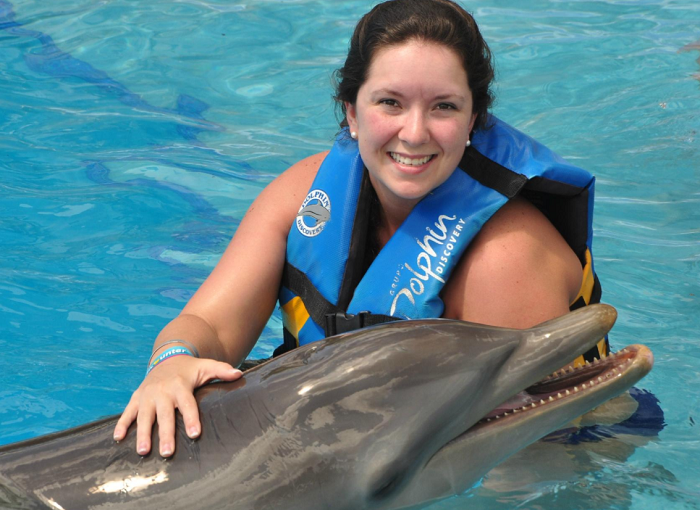 For the “Dolphin Swim” program, you should inquire about reservations 3-6 months in advance. Can I book a private platform? Where and when should I check-in? You must check-in at the Paradise Island Ferry Terminal. It is the only building between the two bridges on Paradise Island. We recommend that you arrive 30-minutes before your boat departure time. This gives you enough time to check-in at the ticket booth and get your wrist band. Our tour is approximately 3 hours long including a 20-minute scenic both ride to and from our facility, an educational lecture, program and time to shower, change, view your photos and make purchases in our snack and gift shops. What times do the boats depart? Our boats depart from Paradise Island Ferry Terminal at four regularly scheduled times: 8:30am, 10:30am, 1:30pm and 3:30pm.There is also a 12:30 p.m. departure. Can I walk from Atlantis to the ticket booth? Yes. The Paradise Island Ferry Terminal is located directly across the street from Atlantis by the Marina Village and Marina. Our check-in window is located closer to most of the lobbies than some of the hotel’s own attractions. We are only a five minute walk from the Coral, Beach and Royal Towers lobbies. How big are your boats? Are they safe? Are they wheelchair accessible? We operate large double-decker, high-speed catamarans that are made to hold more than one-hundred people each. Each boat has life vests and is overseen by a licensed captain and two mates. They are very safe and are wheelchair accessible for collapsible wheelchairs. The boat ride to Blue Lagoon Island is approximately 20-minutes. 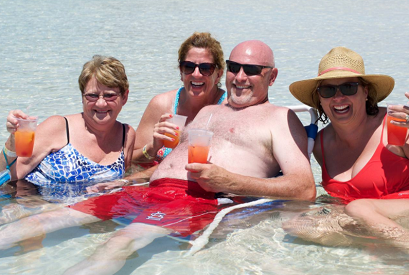 It is mandatory that our boat captains go slowly while cruising through Nassau Harbour. Once they have passed a certain point, the boat increases speed. Is the boat ride to Blue Lagoon included in the price? Our custom-built catamarans range from 53ft. to 70ft. They are registered with the Government of The Bahamas and inspected on a regular basis. Are there life jackets and restrooms on the boats? Do you provide a shuttle service from the hotels and is it included in the price? Upon request, we can arrange for a privately owned bus service to pick you up at your hotel. 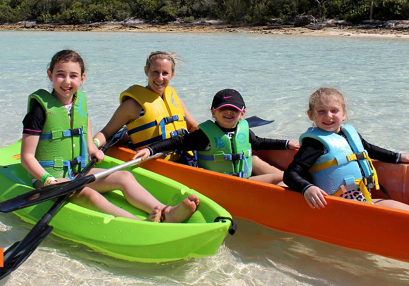 The pick-up time for all Cable Beach hotel guests is one hour prior to boat departure. For Paradise Island, it is 15-minutes prior to your boat departure. What should I bring to the island? You should bring a towel, sunscreen, change of clothing, jacket or windbreaker for the boat ride (during the winter time) and cash/credit card for souvenirs. Please bring all necessary medications with you. Please note that Dolphin Encounters will not be held responsible for any lost or misplaced personal effects. Includes: One of the best beaches in the Bahamas, Blue Lagoon Island, just minutes from Nassau & Paradise Island, is yours to enjoy for the day! 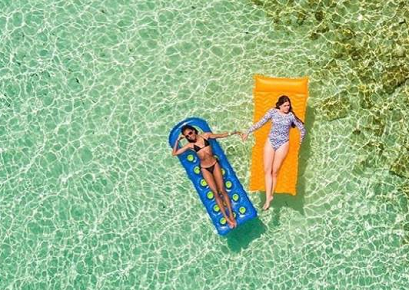 Enjoy the scenic boat tour, swim in the calm lagoon, relax on the serene beach, enjoy water sports, grilled lunch, refreshing tropical drinks or just do nothing but watch the coconut palms sway as you lounge in a double hammock. There are plenty of activities for the whole family to enjoy. Make a day of it! Book Now!